Quite possibly the funniest book I've ever read. Granted, I haven't read many books in the humor genre, but of the ones I've read, Jenny Lawson tops the list (easily beating out pros like Tina Fey and Mindy Kaling). 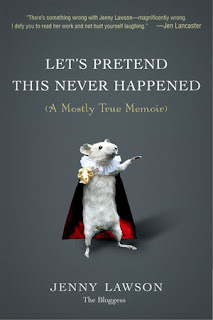 Let's Pretend This Never Happened is a memoir of sorts. It begins with Jenny's childhood in a small Texan town. Some of my favorite bits involved her father, a taxidermist who loves bringing home wild animals as gifts for his family (usually alive, sometimes not . . .). The story continues through her high school years (in which she goes goth), her engagement and marriage, the birth of her daughter, and on through adulthood. Many of the stories focus on themes we can all relate to—family, the awkwardness of youth, love, work, home, friends—but Jenny's experiences are often a little more outlandish than your average American's (did your dad ever throw a bobcat on your boyfriend? did your pet turkeys ever follow you into school and poop everywhere? does your town have flyers in local shops advertising free flying squirrels with rush delivery?). Plus, Jenny excels at making everything even funnier than it naturally is through her tone, vocabulary, and all-around writing expertise. My only complaint is that I wish she'd better introduced her start as a blogger. Her blog (The Bloggess) is her "claim to fame," after all, and I presume it's the reason she was able to publish this book, but she never talks about how she started blogging (it's mentioned that she has a blog, but very briefly and vaguely). But that is a very small complaint for a book I adored. It moves quickly and I was excited to pick it up each day because I knew I was in for at least one laugh. If you're looking for a funny book (and you aren't easily offended), this is the book for you. VERDICT: 4/5 stars. Hilarious. Best memoir I've ever read. I wish I'd experienced this book on audio. It got old in print after a while.